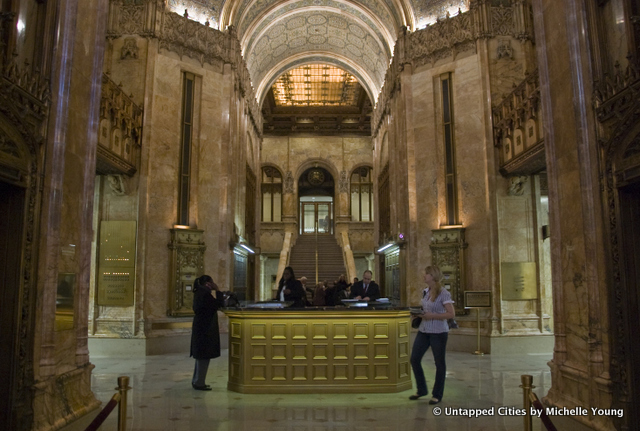 Last month, Untapped Cities was lucky enough to snag a ticket to an exclusive tour of the Woolworth Building with the Skyscraper Museum. The tour, held in honor of the building’s 100th birthday, began in the lobby. With great satisfaction, we stepped past the sturdy “TOURISTS ARE NOT PERMITTED” sign and, under the guard’s watchful eye, gazed up at the dazzling mosaic ceiling and the pinkish marble walls. We only spent about fifteen minutes in the lobby, but we would have been happy to stay there for hours. Clutching our cameras, we tread softly past the old-fashioned elevators and mail drop. We studied the detailed Byzantine-style mosaic, with its glittering phoenixes and florals, and the archways, which are decorated with gargoyle-like busts of the various men who helped build the Woolworth, tucked away like little inside jokes. Our tour was conducted by Carol Willis, curator of the “The Woolworth Building @ 100” exhibit at the Skyscraper Museum in Lower Manhattan. After we gazed and marveled at the lobby, Carol took us down into the basement of the Woolworth. The building is significantly less glamorous, below ground, but it is no less fascinating. We climbed down into the dark, damp space, carefully stepping over a thin stream of running water which, Carol explained, is a constant leak caused by natural geologic features. Next, we took a tour of the various pipes and pumps that keep the building running, including the old, 792-foot fire pump that supplies the building with water. We learned that when the Woolworth was built, it had the tallest chimney in the world. Cass Gilbert, the building’s head architect. Frank Woolworth, the building’s patron and namesake. Finally, in what was easily our favorite stop on the tour, we gathered around the building’s abandoned swimming pool. Woolworth’s vision of the pool—a luxurious and lavish Pompeian pool and hot tub—was never realized; all that remains is a dingy, tiled pit that is covered, mostly, by dusty old boards. However, there are plans to renovate the pool along with part of the building that will be turned into condos. For now, the majority of the building’s property is rented out to companies, just as its patron, Frank Woolworth, originally intended. Contrary to popular belief, the building never served as the headquarters of Woolworth’s five-and-dime business; in fact, the Woolworth Company occupied only one and a half floors (out of 57). In the basement, our tour was accompanied by one of the Woolworth Building’s supers, who entertained us with a spooky anecdote about the building’s elevator system. The elevator shaft is tapered so that, in the event of a free fall, air cushions will prevent the elevator car from gathering too much speed and plummeting to its doom. Apparently, when the Woolworth was built in 1913, they tested the system by allowing each elevator car to fall. Gilbert wanted the Woolworth to be safe and sturdy; its frame contains more steel than that of the Empire State Building, despite being 458 feet shorter. At the end of the tour, we were given another chance to meander around the building’s lobby. As the day drew to a close, the building’s offices began to empty out, and we watched people file out of the elevators and trickle through the front doors. We wondered what it would be like to work inside the Woolworth Building and walk past those ornate walls and columns every day, but the workers—eager to get home, no doubt—barely looked up as they stepped around us, hurrying toward the sidewalk outside. Read about the World’s Tallest Buildings. Get in touch with the author @SCSchnell. There are no words that can describe the interior of the Woolworth building. JUst magnificent. Thanks for the ‘tour’. A modern cathedral to wealth and prestige. These buildings tell such stories. Fascinating and beautiful!